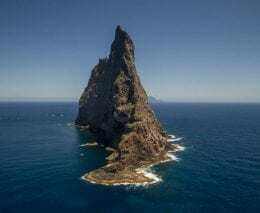 The images in this description come from three different sites on the outside of the reef in the north, in the middle at the dive site known as The Arch, and the south at Erskine Valley, the valley that separates Mt Lidgbird and Mt Gower. 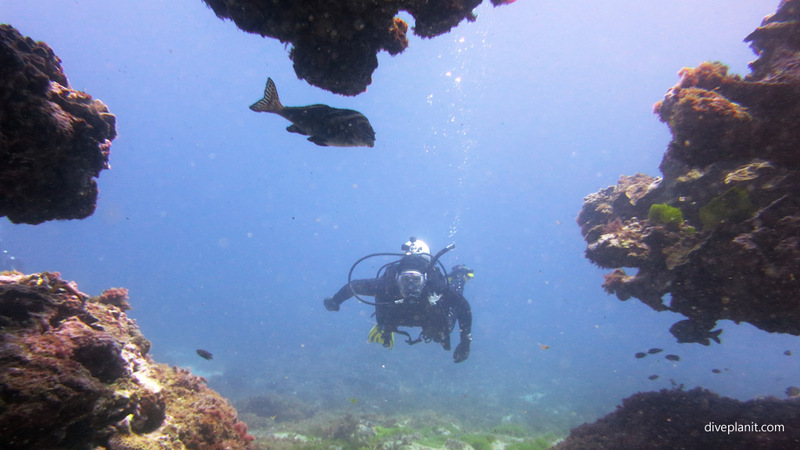 This is my favourite kind of diving: around 18 m where the light is still good and the terrain varied. 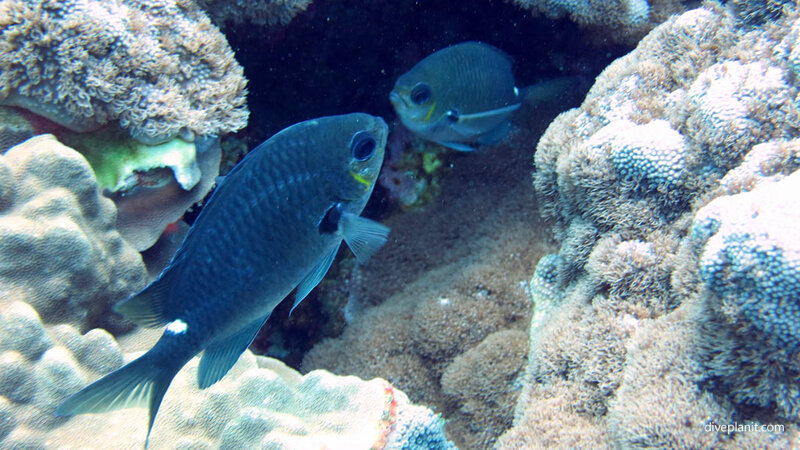 These first fish were spotted at the northern end outside the reef. 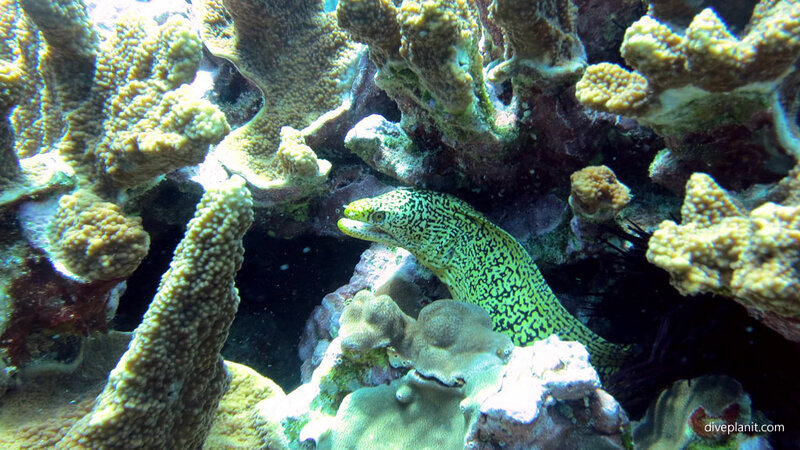 Hiding in the reef there is the mosaic Moray – examples of which we saw in a number of different spots. A group of one-spot pullers. 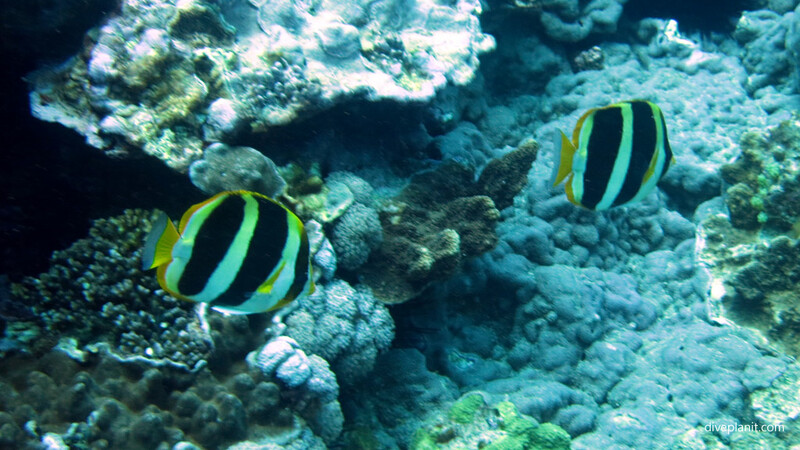 The endemic three banded coralfish with his orange margin. 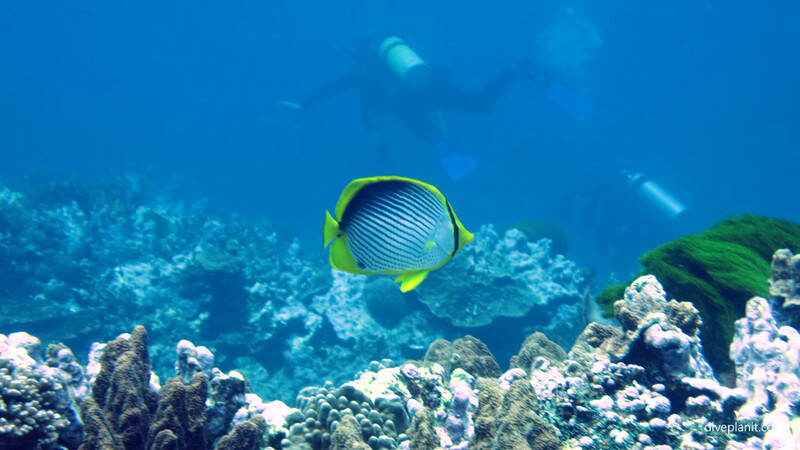 There are many other Butterflyfish, though the black backed seemed most common. 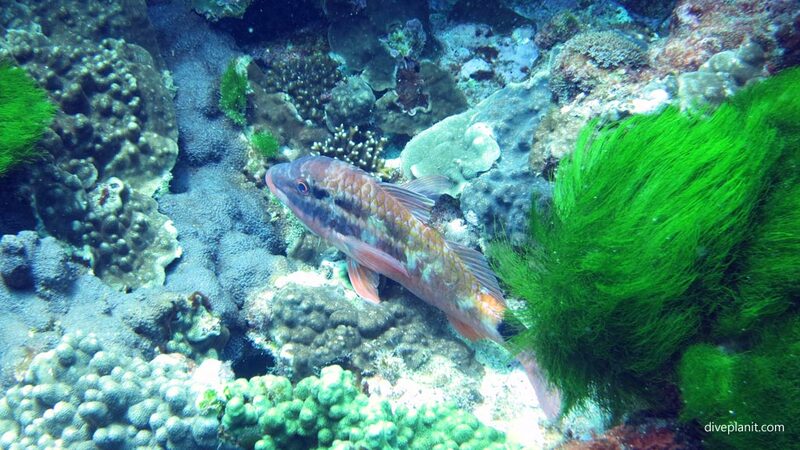 In the coral grit you’ll find plenty of Goatfish – including the common Black-spot. At The Arch, the depth ranges from 6 – 16 metres. 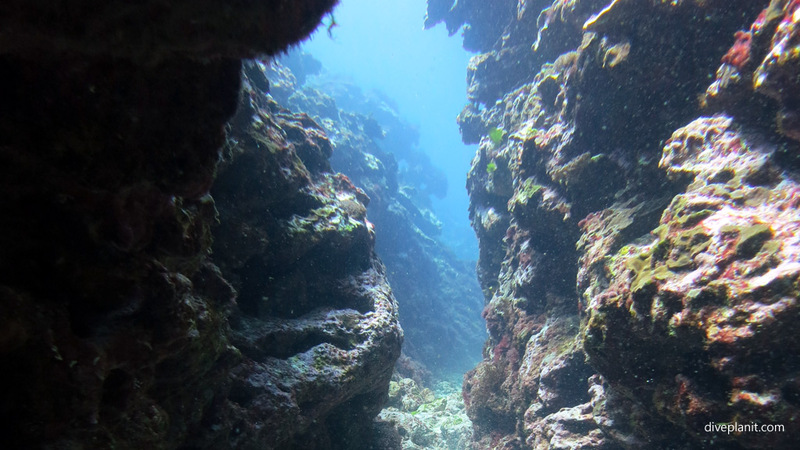 There is a crevice – a large gutter that slices the reef in the direction of the island to the arch, so navigation is quite easy. 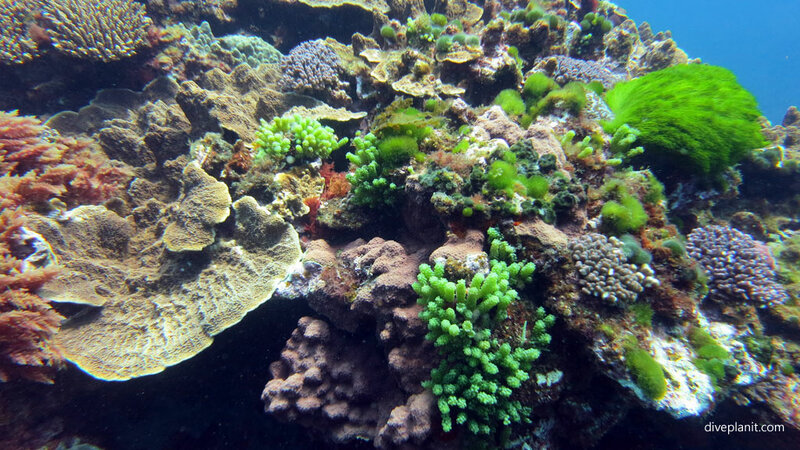 There are some very pretty corals all the way along. 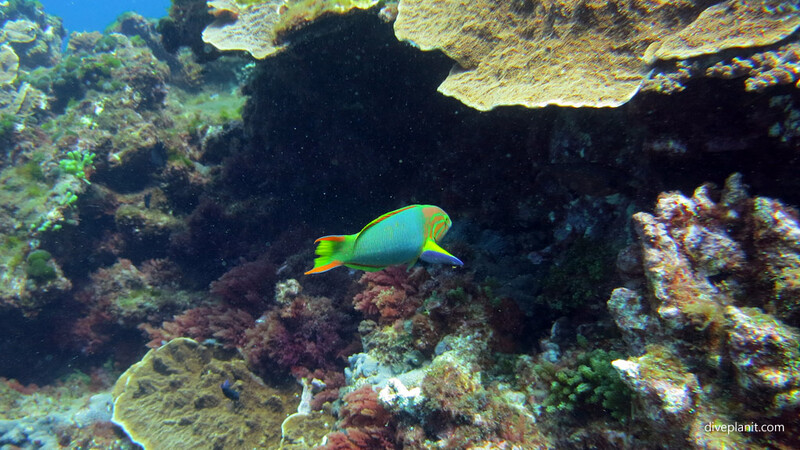 And, where you find pretty corals, you find pretty fish; and as usual, it’s the wrasse, in this case a surge wrasse, who’s first up. 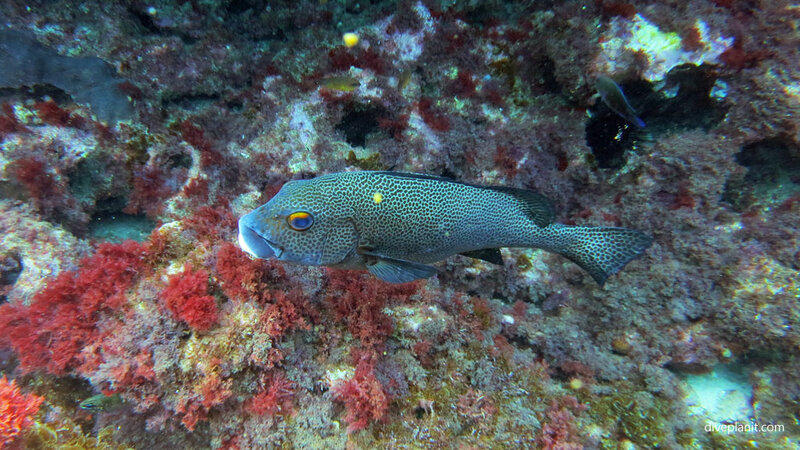 Followed inevitably by a sweetlips. 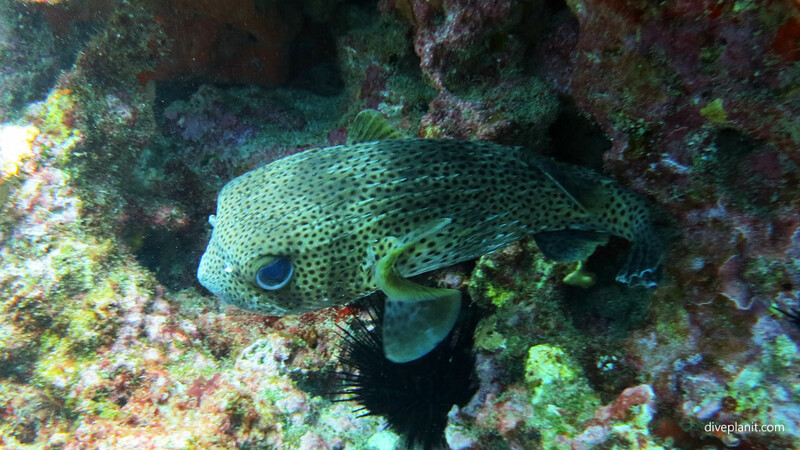 And as spots seem to be fashionable on Lord Howe, we run into this Freckled Porcupine fish – who’s not too sure he’s happy to see us. Down at The Arch proper, you need to stop and grab some of those mandatory ‘silhouetted against the blue’ shots. There are some fun swim-throughs, and lots to see under the over hangs. 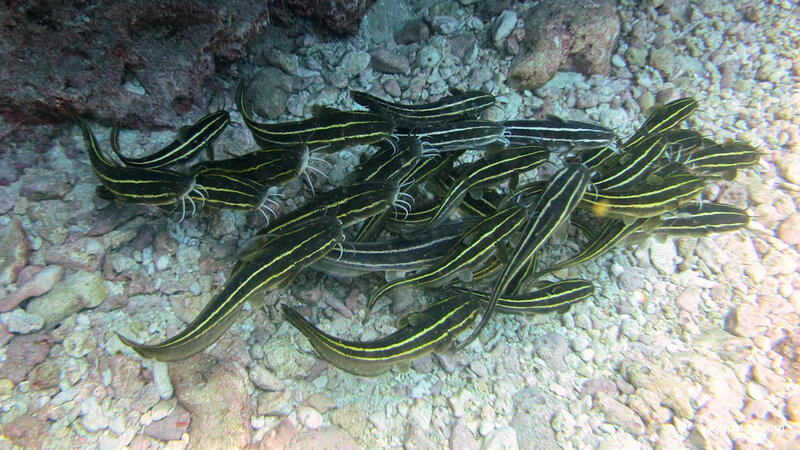 You can’t miss this writhing mass of lined catfish. 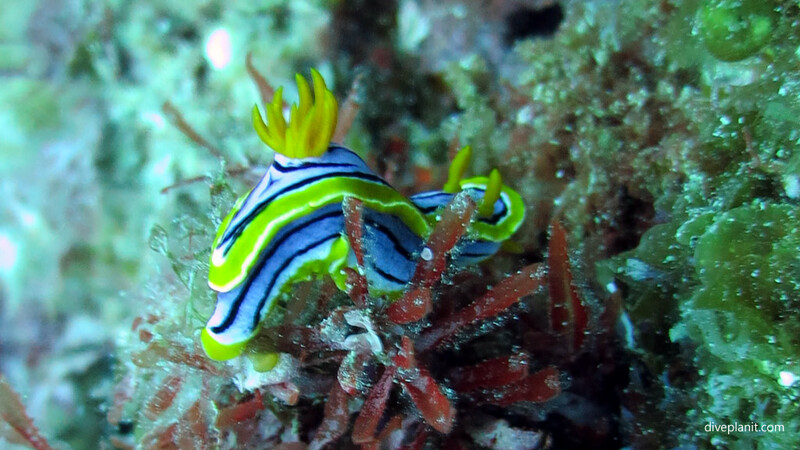 But you will miss things like the nudi’s on the wall if you’re not looking closely enough. Take your time and have a good look around. 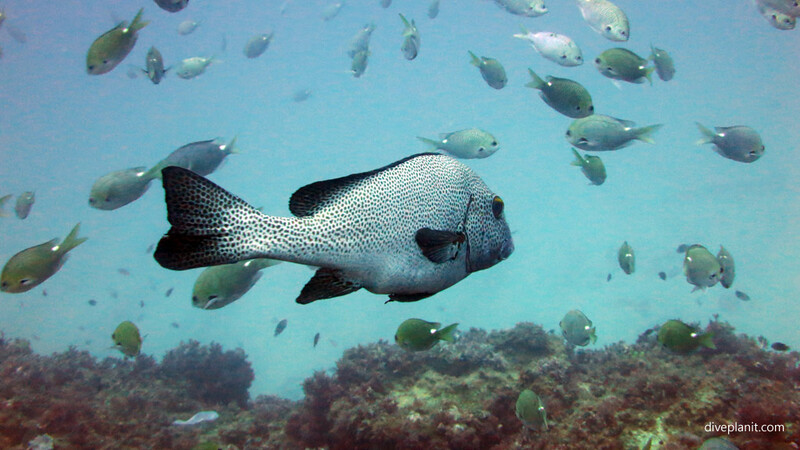 One critter you might also find, though often very unwelcome, is the Crown of Thorns starfish. 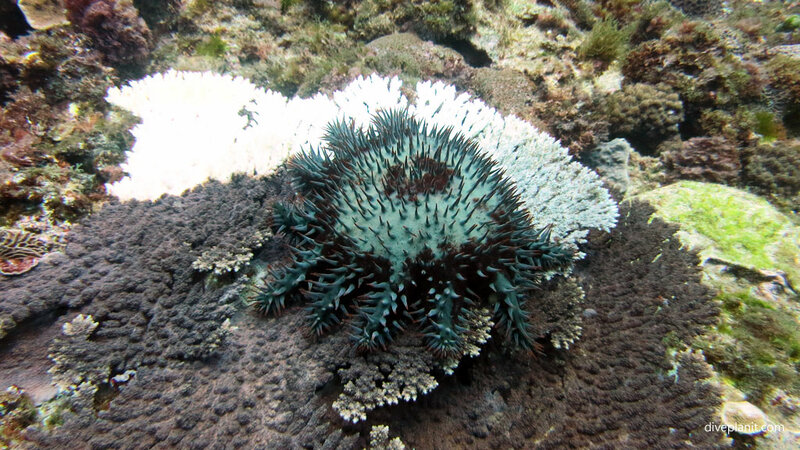 It feeds on the polyps which are the living part of the coral reef. Behind this one you can see what is called the ‘feeding scar’, where the limestone coral skeleton has been stripped bare of its living polyps. 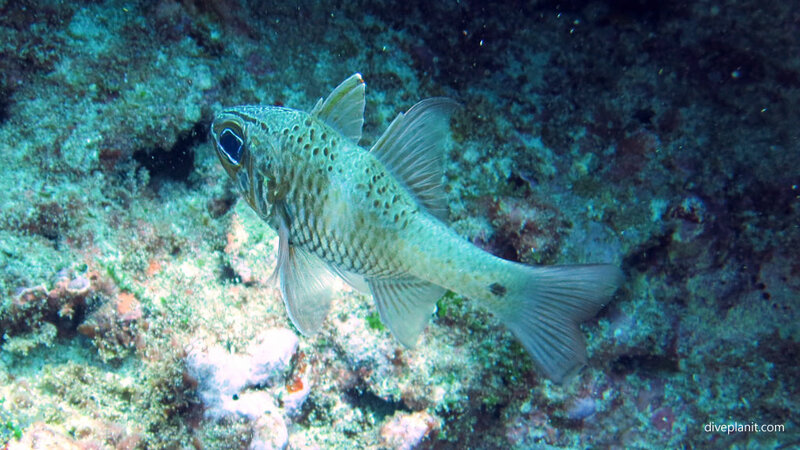 The site is covered with one-spot pullers, which seem to be everywhere on Lord Howe, and the spotted sweet lips. 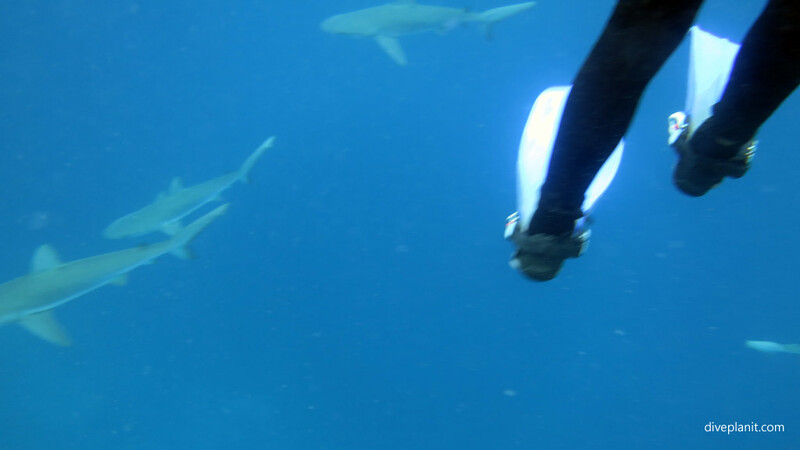 This is another dive where it pays to get down into the weeds and have a good look around. 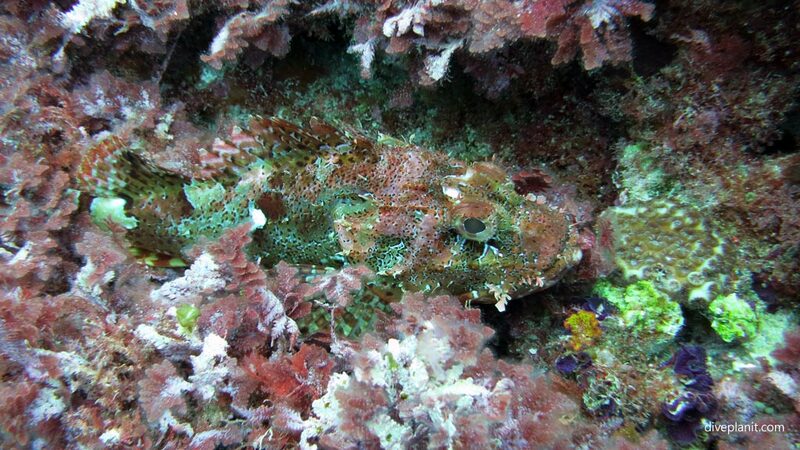 You’ll find the tasselled flathead hiding in plain sight. 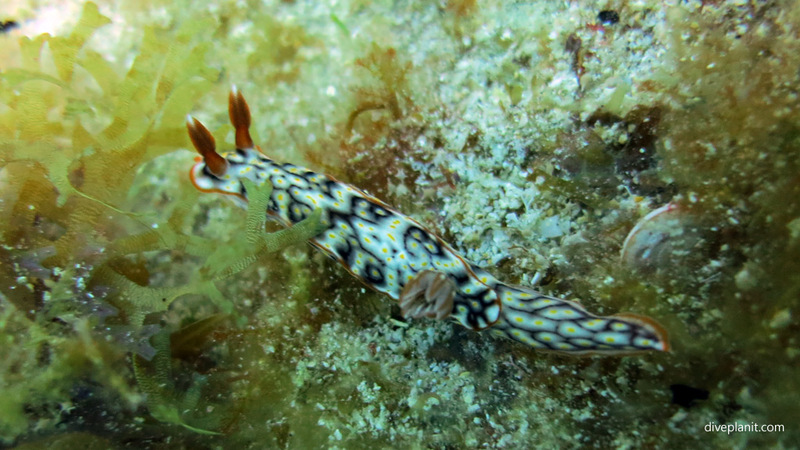 And a variety of nudi’s. 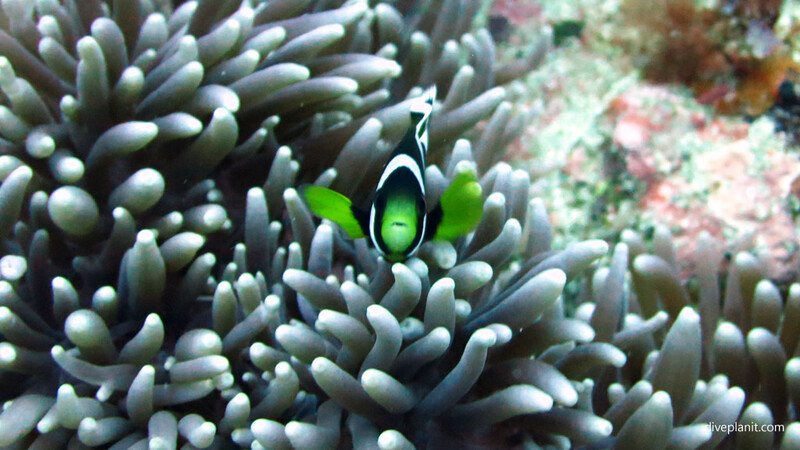 Also hiding, in this case amongst the anemones, you find the endemic McCulloch’s anemonefish.